Today were going to be in Osage Beach MO working on a Showroom Floor!! This floor currently has a checkered plastic tile that snaps together so what we’re going to do is remove that, once the checkered plastic tile is removed we’re going to breakout our new floor grinder and grind off the concrete paint that is under that tile. Once we have the concrete paint removed from the concrete surface the pores are now open to receive our New Epoxy Floor System. But wait… There is some damage to this concrete as it is at least 20 years old what I mean by damage is there are TONS of pot marks, several large and long cracks that need our attention first, so we go in open up the cracks and repair them the same goes for the pot marks we fill and level them up and then grind everything flush. So now we breakout the mixer, open up the cans of our two-part epoxy and go to work!! Since this is such a large area and there is only 2 of us I’m just gonna put half the epoxy down, throw some Vinyl Chips then do the second half the same way normally I would do the entire floor and throw the chips, but with just two of us, time being a factor it just makes sense. Okay that was pretty easy,,, so now the next step is let it dry come back the next day will scrape everything down get all the loose chips removed from the floor cleaned up and will be ready for the clear Epoxy. Everything looks good we have the floor scraped clean and ready for clear Epoxy this time because we do not obviously have any vinyl chips to throw down were just going to mix and pour this entire floor in one shot. Last day on this job the only step that we have to complete today is to put a protective coat over our epoxy which will make it much more durable. 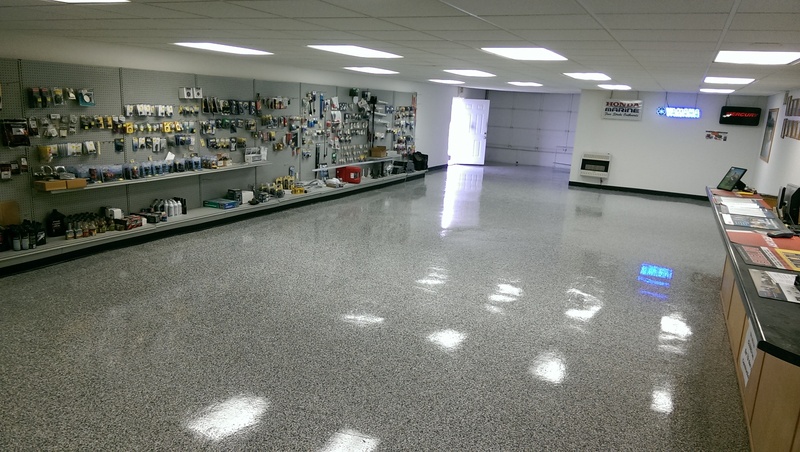 This job is now complete, this is the same system that we use for our garage floors it’s tough, it’s durable, long-lasting and dresses up any space that you may have. Call me for a FREE Estimate. OR – You can Fill out this Convenient Contact form located HERE and I will Contact YOU!! Thank you for Visiting my Website, come back again soon….